UPDATE: This competition is now closed. Thank you for participating! It feels like April just began, yet May is already here! 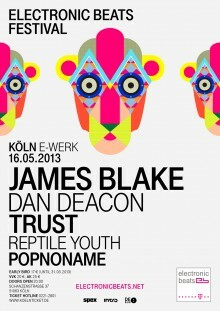 With the Cologne edition of our Electronic Beats Festival series fast approaching, we know you’re getting anxious—who wouldn’t be, with beat-boys like James Blake, Dan Deacon, and Trust headlining, with support from Reptile Youth and Popnoname? We’re giving away 15 pairs of tickets for the festival. All you have to do is send an email to community@electronicbeats.net with the subject “Cologne 2013” before 6pm, Sunday the 12th. Winners will be notified the following day, Monday, May 13th. For those of you who want to go regardless, tickets can still be purchased here, here, and here. See you in the front row!